One month to go before Christmas and what better way to start feeling the spirit of the yuletide season than to watch an adaptation of the widely known story of "A Christmas Carol" by Charles Dickens. This latest take on the classic novel stars Jim Carrey as Ebenezer Scrooge and the Ghosts of Christmas Past, Present and Yet To Come. What makes this quite different from previous adaptations is that this is on 3D animation and utilizes IMAX technology to bring its characters more to life. Can this movie justify another one when compared to previous adaptations? Read on to find out. On the day before Christmas, Scrooge (Jim Carrey) goes home to his big and empty house and is visited by the ghost of his long dead partner, Jacob Marley. Jacob is carrying with him his heavy burden of chains as payment for the greedy life he led. He came to warn Scrooge that the same fate awaits him if he does not repent and change his ways. Three spirits will visit him that night: The Ghost of Christmas Past walked him through his life, as a neglected son left to spend Christmas alone in his school followed by his life as a young man who fell in love with a woman named Belle. Belle eventually broke off their engagement when he started to be obsessed with wealth. The Ghost of Christmas Present showed the happiness and cheer he chose to miss out because of his greed. Finally, the Ghost of Christmas Yet-to-Come showed him the consequences of his past, and the sad death that awaits him. All this melts his frozen heart and awakens Scrooge into a new man. A man who knows how to live the true Spirit of Christmas. Watching the movie in 3-D left us wanting to put our hands out and catch the snow fall and even dodge the approaching chimney as Scrooge came flying out the window. It also made us want to sing along to the jolly Christmas carols. However, the movie fell short of our expectation of the heart-wrenching story that is "A Christmas Carol". It did not leave us teary-eyed and wanting to write a check to charity. Maybe this was caused by the character's thick accents which made it hard for the audience to understand some of the dialogue spoken. On the other hand, children will love the cartoon feel of this movie with Scrooge flying from one place to another and shrinking to pint size. Some parents though should leave their kid's night lights open after watching this movie as some kids may find the Ghost of yet To Come quite disturbing. But as always, Jim Carey left a stamp on Scrooge and the three spirits even with just his voice. You can clearly see a different Jim Carrey in all the characters he portrayed. Noteworthy is Gary Oldman’s performance as Bob Cratchit, Scrooge’s loyal clerk. His loyalty and love for the miserable old fool reminds us that the world can be a cruel place to live in but it is up to us to see the beauty within. Overall, we suggest that this movie is best watched in IMAX 3D. Till then, have yourself a Merry Christmas! 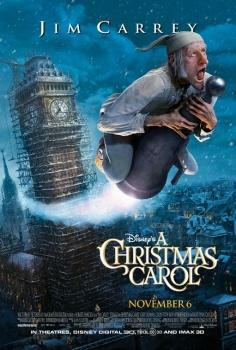 Catch "A Christmas Carol" starting November 25, 2009 on all regular cinemas and IMAX theaters around the country. This was a guest review by Dianne Dy and Jewel Dy. Catch them on Dianne's Multiply and Jewel's Tumblr. Both are selling Christmas ham with pineapple sauce which already comes in a designed box, good for giving gifts. You can order from .5 kg to 2kg. Delivery charge will be applied depending on the area. Price is negotiable. Text 0917-8669500 for inquiries.